A member told me to take a look into this thread after I had some issues with installing clover. It was a great hint so I installed the automate-eGPU. For the first it look very well and I was able to play some games with the eGPU now. The weird part is that if I play a game like Pupg everything is fine but if I want to start games like Black Ops 4 or Warframe the eGPU doesn't work. I got an MBP 2015 15", the Razer core x and a GTX 1070. If this question is already asked once somewhere else I'm sorry for this reply. If there is any solution already I would be grateful for a helpful answer. 1. Boot into windows WITHOUT the eGPU connected. 2. Run DDU and clean your system of all remnants of any drivers. 5. Once windows loads shut down. 6. Boot into windows but this time plug in your eGPU. When I boot, it takes a few seconds to identify the external monitor, then I'm allowed to login I via the external monitor. In the meanwhile the internal display freezed at the boot-logo of windows and its starts to flicker. I can play games and use all applications via the external monitor - full usage use of windows 10, BUT my internal MacBook Display just stays at the boot logo (windows) and flickers. Do you (someone) know(s) what's wrong? I don't really need the internal display, so if there's a way to disable it, I could game on this mac by using only the external monitor. But actually the flickering is very terrible, also I don't know if this isn't good for my MacBook. Is there any iMac user got eGPU detected in bootcamp windows? BIOS mode or EFI mode bootcamp windows? I can use eGPU with this script, but cant boot into BIOS windows ..
Hi everyone, first huge thanks go @goalque for the amazing work. I never thought 3 months ago that my 2012 macbook pro could be upgraded with an egpu! Once I got back to my desk and tried to reenable purge-nvda macox booting process will stuck at the black screen with the open logo and the white progress bar, no matter how long I left it running. I managed to reboot after doing a nvram restore –which reverts back System Integrity Protection– after that I have tried to replicate the results of purge-wrangler and purge-nvda with no luck. Each time I run purge-nvda, press option 1 (AMD eGPUs ) and reboot the booting process will stuck at the black screen with the open logo and the white progress bar. I found automate-eGPU EFI searching for a solution so I tried this instead. First uninstalled purge-wrangler and purge-nvda and then followed the instructions. I am able to boot on Macosx and the eGPU is recognized after login –icon showed at the bottom right corner and so on– but I am having the same behaviour as before, external display connected directly to eGPU remains black and integrated display appears as secondary screen. On system preferences my 3 graphics appears, radeon 580, HD graphics 4000 and NVIDIA GeForce GT 650M. From my previous successful seting I understood that I need to disable the GeForce GT 650M in order to make the external display (connected to the eGPU) work again. Any ideas? I may be missing something very obvious, went through this super long post but I couldnt find any explicit reference to this issue. @javito This solution does not include patches that are used in purge-nvda. When you encounter black screen after using this script, simply redo the iGPU Mux option in single user mode. This is a known issue (firmware does not change mux sometimes after script option #1 and can’t do much about that). This is how it normally behaves when you aren't using Automate egpu at all. Without any help, egpu DOES work with bootcamp on some models but works exactly as your video shows. The iGPU disabled on boot and eGPU is the only GPU active (internal display stops functioning) Automate egpu doesn't seem to be booting properly for you. Tell or show us your boot process from powering on. On my 2018 macbook pro 13", I have to try and try again sometimes booting from automate-egpu for windows to properly detect the Vega 56 egpu + igpu. Sometimes it only boots up with igpu and code12 on egpu when booting automate-egpu, it's not consistent. When it does work, it works very, very well. 1) Does running Windows off of an external SSD pose any problems for automate-eGPU? 2) How long does it normally take Windows to load after I boot through automate-eGPU? The reason I ask is because currently, if I choose my boot options, I have Boot EFI for both my external Boot Camp Windows SSD Drive and my Automate-eGPU EFI Flash Drive. When I boot to automate-eGPU and select Windows, it just hangs there and nothing occurs, even when I wait over 10 minutes. Many thanks @mac_editor I will try that, any suggestions on how to proceed if boot sequence do not work? macox booting process stuck at the black screen with the open logo and the white progress bar, a nvram restore seems to allow me to reboot safely but not sure if purge-nvda settings are reverted after a nvram restore. Thanks again for your tremendous help! Apologies, I understand now what to do if the booting sequence does not work. Many thanks! Is this compatible with a custom EFI for a USB install of Windows 10 using WintoUSB? I'm able to boot into macOS from the EFI, but when I select Windows, it just hangs and sits there and becomes non-responsive. I don't know if this is because it takes a long time for Windows to load, or the EFI is unable to locate my install of Windows. Any suggestions would be appreciated. is there anything I can do prior to running the EFI to help it recognise the egpu or tests I could run? The scanning of the eGPU is not accurate, it doesn't work with all kind of Macs and the message "eGPU not detected" is common. In that case, the eGPU should still appear as the last element in GPU(s) row: [0x10DE 0x1B06]. iMacs are out of my expertise. I want to emphasize that this app is only experimental. Some Macs just don't work due to various firmware implementations and the boot process can get stuck at some point. The debug log shows where. @corbot5000 This app supports Win10 installations done in BootCamp assistant, in the internal partition. Turn on debug flag to see what happens (be patient, writing is very slow). Now its working. Dont now why. I also can see the small icon for the egpu. Really strange. Hi, there is a new update again available for Max OSX. I am scared to install it. What will be the correct way to install it without problems? I tried installing the latest update to Mac OS 10.13.6, security update 2019-001, on my Macbook Pro 17" (mid 2017). After the update was installed my system couldn't find the eGPU (Aorus Gaming Box GTX 1070) and on the driver app of Nvidia there was a message that "No driver found". For updating macOS, you should disconnect the eGPU and reboot without the EFI (at least once, maybe 2 times for safety). Then install the update. Then, the eGPU should work after restating with the EFI. I've been having a weird issue with every macOS update, which is that the EFI won't work until I install, then uninstall purge-wrangler. This was true even after doing a full system reinstall and restore from time machine backup. Not sure what's up with that? Maybe a lingering kext issue? @nu_ninja Not sure, but are you using the script and EFI solutions simultaneously? That shouldn't be needed. NVM, I see you meant the install/uninstall aspect. Well and in my case, flawless update to 10.14.3 (18D109) with no issues whatsoever with my eGPU. Per mentioned by @nu_ninja above, I always disconnect the eGPU and reboot twice without the EFI before updating. Then, I install the update. Then, the eGPU works perfectly after restarting with the EFI. So just updated to 10.14.3 as well, and I can't get mine to work anymore. I didn't disconnect while I was updating, could that have caused this? OK well I've already done the update, what can I do now to fix it? Make a small executable script and run it as sudo. Or reinstall macOS from the recovery. Rebuilding kernel caches may help. Indeed it did, thanks a tonne! 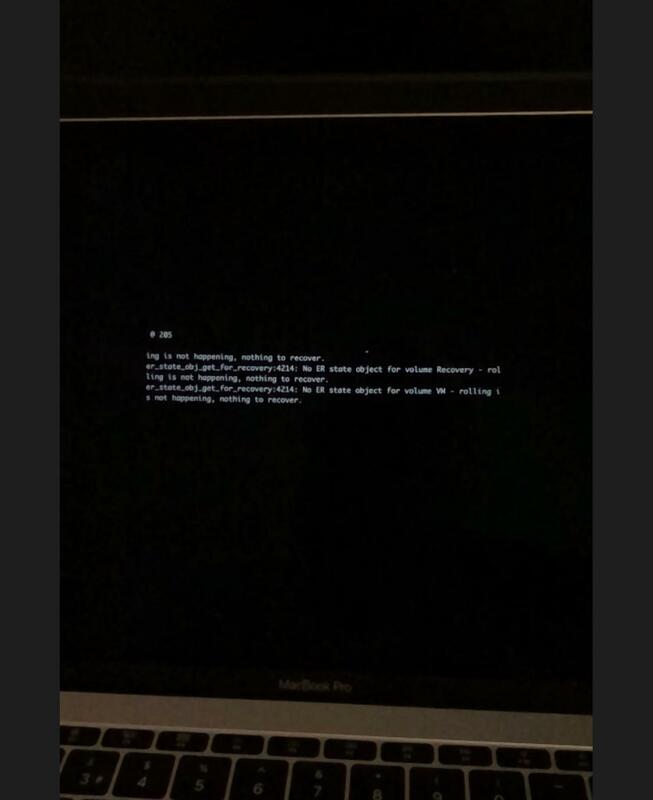 Does anyone know what's up with this flash message on boot (followed by a dark screen)? Had to record it with slow mo on my phone lol. I have a macbook pro 13'' 2016 non-touchbar and an Omen Accelerator. i would like to ask, previously i had purge wrangler script but i wanted to use yours because i need to use windows sometimes. trying to remove previous scripts, i find that i cannot boot to recovery at all. its asking for password. could you or anyone for the matter tell me what's going on its driving me nuts. First of all, great tool @goalque. Under Windows Bootcamp (EFI), it is a different story. It is summarized into points. 2) Adding a modified AML under EFI/CLOVER/ACPI/WINDOWS does not result in a large memory area. Apparently it is not using that modified AML. 3) Doing a registry override with the same modified AML and Windows Test Signing Mode does result in Large Memory, but does not solve Error 12. My setup is listed below in my footer. 1) The password may be your admin password? 2) I used to use PurgeWrangler myself before switching over to this. I never had to boot into recovery mode to remove PurgeWrangler. I was able to do it from my admin account. I can guide you through the process if needed. Basically you just run purge-wrangler from the command line and then there is an option to uninstall. Let me know if you require more help. Thanks for responding. First off I apologise I should inform what setup I have. I've al 15" late 2014 mbp+sonnet breakaway rx580. The mbp has the Intel Iris pro. Anyway later on I found purge wrangler and it's been great but now I need an easier less daunting way to setup windows as I need to use some softwares unavailable to Mac. The first step in @goalques script requires removal of all previous scripts so I tried to remove purge wrangler. Lo and behold I find I'm unable to. All my files are off my computer so a clean installation is not an issue. I try to boot through recoveryOS and that's where I see the lock screen. I learn it's a firmware password which I've never set nor know of. It's been a few years now so I've no clue where my purchase receipt is. I check diskutil and my efi is not in the first partition. I'm sure the screw up started when I meddled with my hard disk from that YouTube configuration. I can't even turn on system integrity now. Once again thank you for any help you may assist me with . Mac mini 2012 server with latest High Sierra & all security updates. When I select Boot macOS from the EFI USB the system just hangs... USB is FAT32 + MBR, have deleted the apple_set_os.efi but can't make it pass the boot screen. My eGPU is Akitio Thunder 3 (connected via Apple's Thunderbolt 2<->3 adapter) and I'm running GTX 780 3GB. I haven't downloaded web driver as this GPU was / should be supported natively by macOS. Any suggestions how to resolve this pls? Turns out I kept a using HFS+ on my system, UFI seems to work only with APFS. @john_jeremiah_sekar Uninstall it? That's all you need to do in the script. Then set up EFI and you should be gold. my hard disk partition is as below, can you spot any anomalies or its all ok to proceed as you've suggested? i appreciate the time you take to help me out. Sorry man. Do not know what to tell ya. I'm still struggling with getting Bootcamp to work. It is not easy at all. @john_jeremiah_sekar I cannot tell from the disk layout if there is anything amiss. All I can see is that /dev/disk1 is you macOS install, /dev/disk2 an external drive call EXT HD, /dev/disk3 called EXT SSD, and /dev/disk4 seems to be a 120MB mounted disk image. Please use an extra partition (on an external drive) or preferably a pen drive that does not have sensitive information to create your EFI stick. For simplicity I recommend the installer (disconnect all other disks before using for safety), or create it manually with the provided steps. Edit: I realize from your previous posts you may be trying to debug your Firmware password. Disk layout does not help. You will need to contact Apple to bypass that (though there is a potential way to reverse-engineer this password, I haven't tried it nor is it simple :p (hint: it's not and depends on a variety of factors)). I'm hoping to use dual Radeon Vega 64 with a MacPro6,1 trashcan on Mojave 10.14.3. Is this a supported configuration? I tried purge-wrangler but it doesn't allow booting with both chassis attached. I fully removed it, but the validate-kexts script fails. The error is this. I'm running macOS 10.14.3. I even downloaded the Mojave installer and extracted this kext with Pacifist, but it gives the same error. Will this prevent your script from working? Update: It's working with one eGPU attached to port 5 or 6 and the monitor connected to the internal HDMI. If I have two eGPUs connected at boot, I just get a black screen. Likewise, if I have one eGPU and the monitor connected to that, I just get a black screen. If I connect one eGPU to ports 1-4 then I get a black screen. I would like to leave both eGPUs attached all the time, preferably on separate busses. Is this possible? Attached is the image I get when it boots successfully. Not sure why it says eGPU not detected. Warning: Don't install 10.14.3 supplemental (18D109) update on a Mac Pro. I had this working ok on 10.14.3 with one monitor on internal HDMI and the other monitor on eGPU, but after installing the supplemental update my eGPU monitor is black. The Vega is not detected in Graphics/Displays section of System Profiler. The Sonnet chassis is detected in the Thunderbolt section. Update: I fixed it by updating kextcaches and resetting NVRAM and SMC. Not sure which part actually fixed it though. Ok so maybe it's unrelated then. After searching I have seen several people running that build successfully. But for me the problem started immediately after the supplemental update. The problem happened again today and so far I've been unable to fix it. I will be doing more troubleshooting tonight. Now I'm in a loop where I see the 'q' screen, followed by the Apple logo, then it goes black and reboots. Works fine if I unplug the eGPU. "0x1600000" : "[email protected]/IOPP/[email protected]/IOPP/[email protected]/IOPP/[email protected]/IOPP/[email protected]/IOPP/[email protected]"
I got it working this time by uninstalling BWFS kexts. This is strange, because the problem was definitely happening before I installed those kexts. Now that I have it working again, when I run the validate-kexts script it says my system is clean. Is that normal, since clover is patching IOGraphicsFamily and AppleGPUWrangler? Is this because clover patching is only done in RAM and kextutil is checking the files on disk?